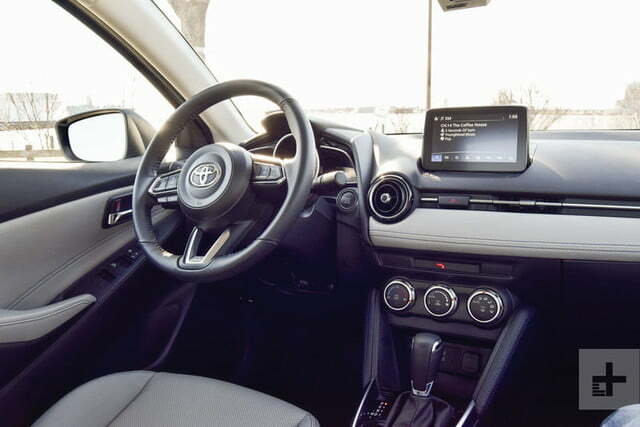 The Toyota Yaris Sedan is aimed at urban dwellers, ride-sharing drivers, and consumers on budget. While the Yaris Sedan is now officially a Toyota in name, the subcompact model is built by Mazda and is heavily based on the Mazda2, which isn’t sold in the United States. Get past the confusing name changes and you’re left with a fantastic product. 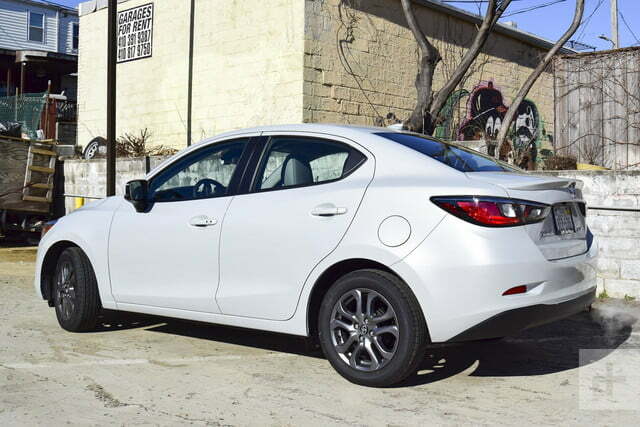 You get Mazda’s engine, Mazda’s upscale cabin, and Mazda’s energetic chassis in a package with a Toyota badge. Scion may be out of the equation for good, but the Yaris still appeals to those looking for an affordable mode of transportation. That explains the sedan’s low price tag of $16,380, which includes the $930 destination fee. Despite the miniscule starting price, you get things like 15-inch wheels, a 7.0-inch touchscreen, a low-speed pre-collision system, Bluetooth connectivity, and remote keyless entry. Our test vehicle was a range-topping XLE, which gains items like automatic climate control, leatherette upholstery, a Sport driving mode, automatic LED headlights, and rain-sensing windshield wipers. All of the extra features tipped pricing for the vehicle up to $19,470 – still a bargain by today’s standards. 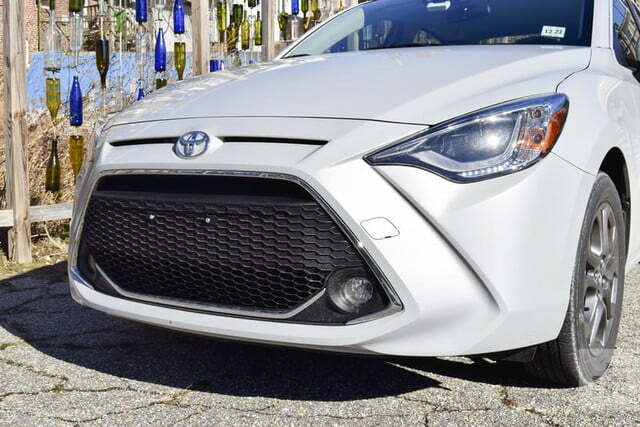 Look past the Yaris’ somewhat awkward fish-like face, and you might be fooled into thinking this is just a more compact version of the Mazda3 sedan. 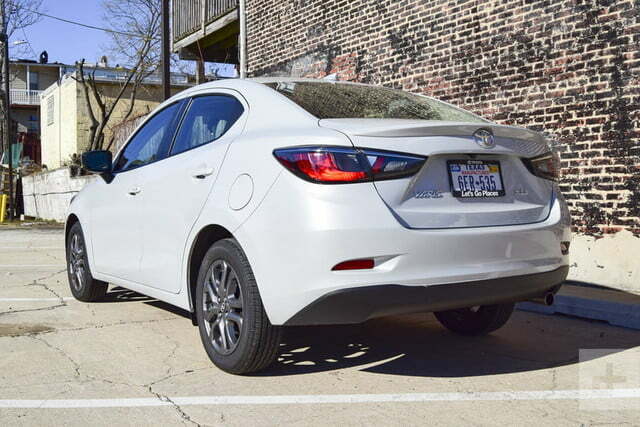 It’s a handsome vehicle, especially for the subcompact segment, with flowing lines and round edges. 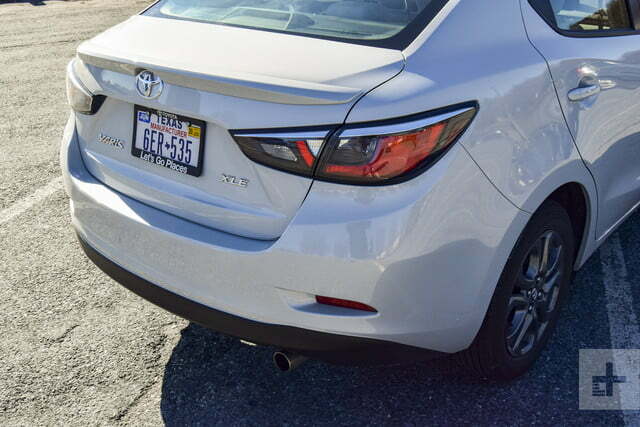 The XLE we tested was also the sportiest of the family, featuring LED daytime running lights, a rear spoiler, and 16-inch wheels. The Icicle paint worn by our tester was also a nice touch. You won’t be winning any drag races but you’ll be able to dart through traffic and claim the last parking spot in the nick of time. It’s a similar story on the inside, where the Yaris punches above its weight thanks to, once again, a large helping hand from Mazda. 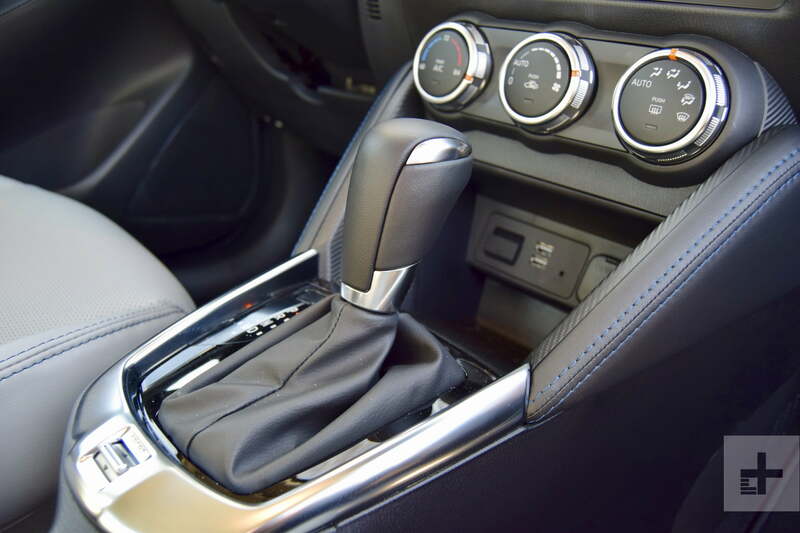 Slide into the cabin, and it’s easy to forget that this is one of the more affordable vehicles on the market. 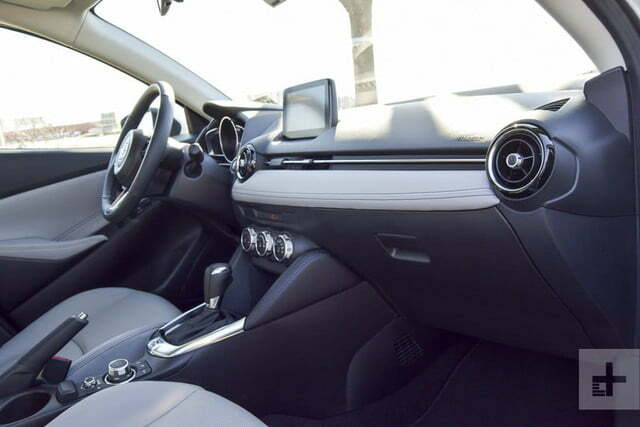 The dashboard has the same clean lines as the exterior, except for the prominent 7.0-inch screen that looks like it’s been tacked directly onto the dashboard. 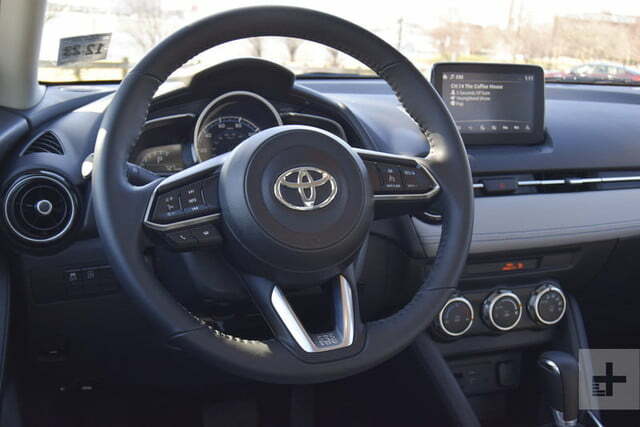 Toyota also adopted Mazda’s ergonomic setup of placing the infotainment system’s controls on the transmission tunnel behind the shifter, and it was a brilliant decision. The buttons are easily accessible and simple to use. This layout also helps the dashboard look less cluttered. 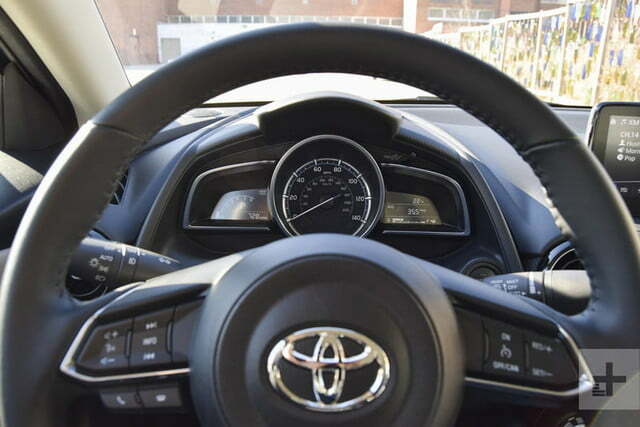 The large dials for the climate control system are also a welcome touch, being easy to control and read. If there’s a lesson everyone can get out of the Yaris, it’s that simple is better. Where the Yaris misses the mark is in seat comfort. 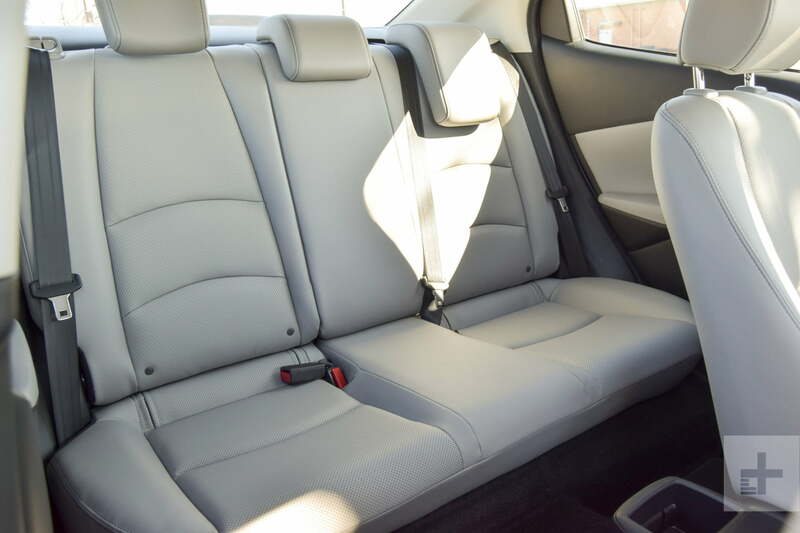 The front bucket seats aren’t exactly comfortable, as they lack lumbar support and have incredibly hard stuffing. We had trouble finding the perfect position, too. Sometimes, the steering wheel felt too far away, but our legs were in the perfect position. Other times we felt too high up and wanted some more room for our legs. The largest issue with the Yaris, though, is rear-seat space. With the driver’s seat in an acceptable position to fit our 5’10” frame, our knees were rubbing up against the back of the front seat. Comfortable? Not really. Doable? Yes, absolutely. But you wouldn’t want anyone you like sitting back there for more than 20 minutes. 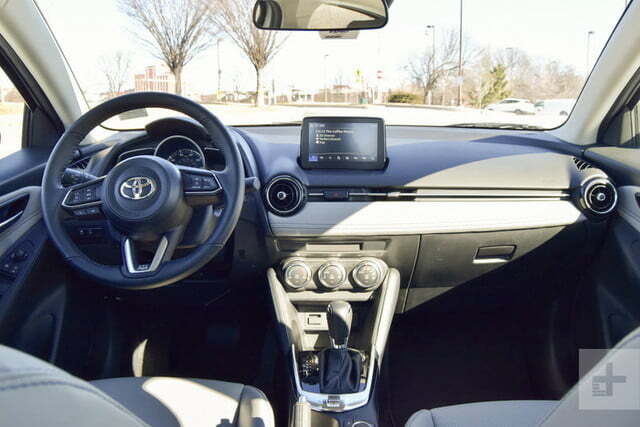 Toyota reduced the list of tech features to keep the Yaris affordable. While the 7.0-inch touchscreen running Mazda’s infotainment system is simple and easy to use, even our range-topping XLE vehicle lacked Apple CarPlay and Android Auto. Navigation wasn’t included either, but at least that’s available. 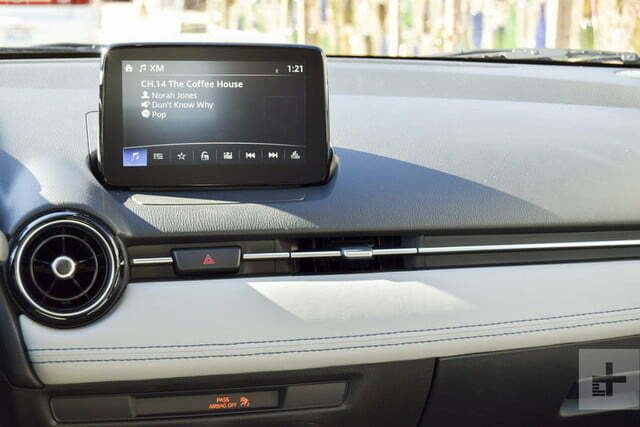 What the infotainment system does bring with it are two USB ports, Bluetooth, and a decent six-speaker audio system. In terms of safety, there’s a backup camera and a pre-collision system that works at speeds of up to 18 mph. If you’re looking for anything else, you’ll have to check out the competition. That doesn’t bode well for the Yaris, as the seasoned leader, the Honda Fit, comes with everything you could ever ask for in terms of advanced safety features. 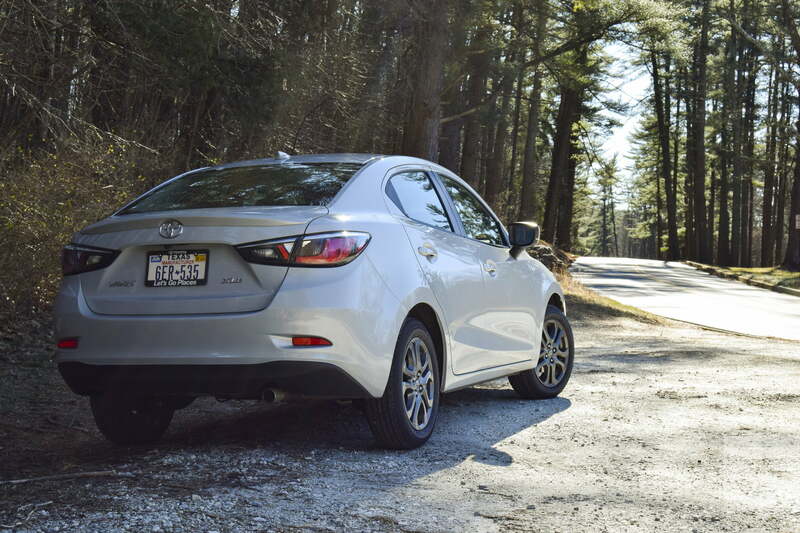 With only 106 horsepower on tap from the Mazda-derived 1.5-liter four-cylinder engine, getting the Yaris up to highway speeds is a test of patience. The Yaris may be a lightweight, tipping the scales at under 2,500 pounds, but smashing the throttle to the floor results in little go and loads of noise. 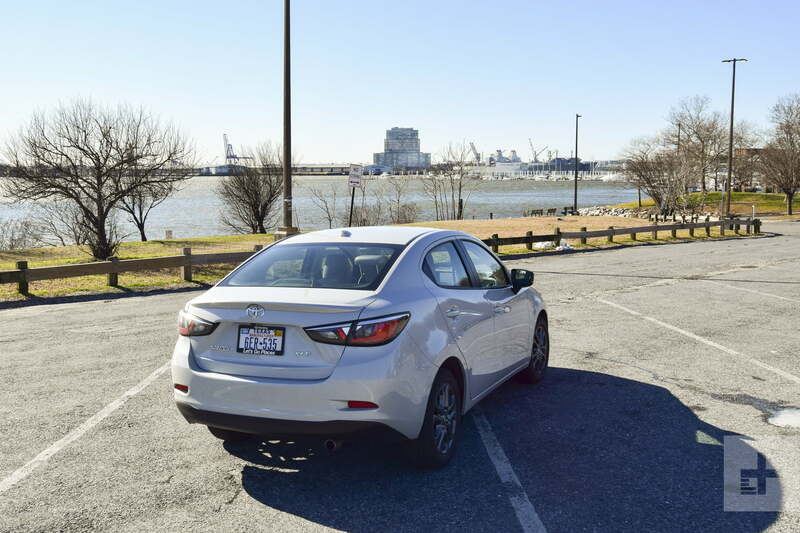 What you do get with the engine is an EPA rating of up to 32 mpg in the city, 40 mpg on the highway, and 35 mpg combined, which is good for the segment. 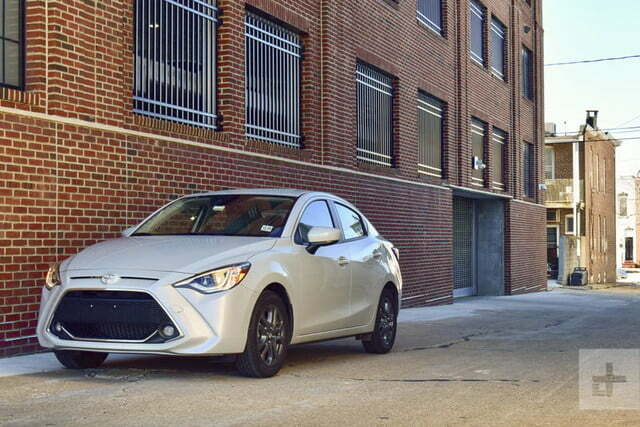 At lower speeds, especially in the city, the Yaris’ lack of power isn’t as noticeable. You won’t be winning any drag races, even if it’s against a minivan, but the small sedan’s compact size means you’ll be able to dart through traffic and claim the last parking spot in the nick of time. Get off major roads and onto something that’s a little curvier, and you’re definitely in for a good time. 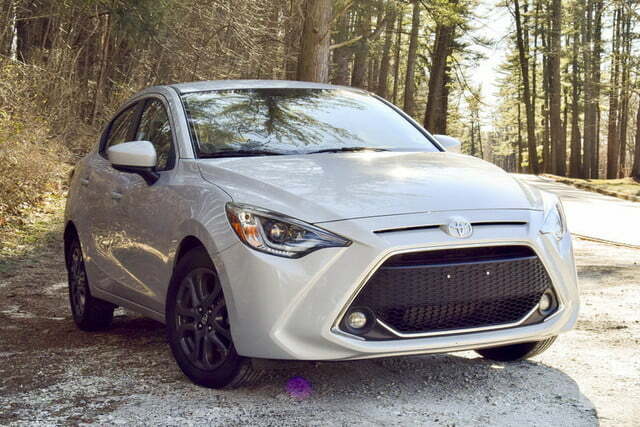 Standing as a reminder that big cars with big power aren’t always the most enjoyable to drive, Toyota’s, or rather Mazda’s, chassis and suspension tuning give the Yaris a nimble edge. 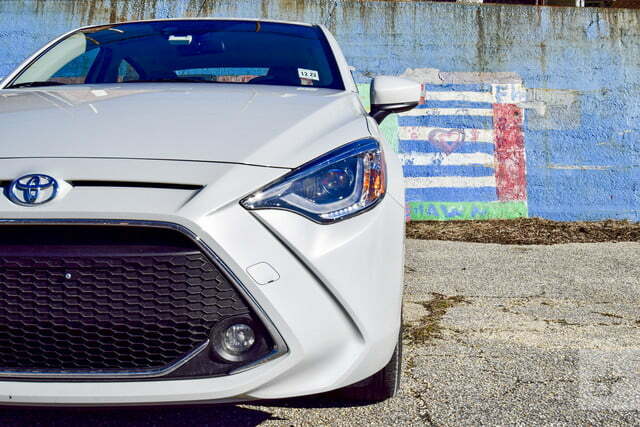 While not as sharp or as enjoyable to drive as a hot hatch, push the Yaris and it’ll be hard to stop yourself from grinning. Being able to adeptly tackle a corner doesn’t come at the expense of comfort either, as the suspension is firm but supple. While Toyota isn’t offering a manual transmission in the sporty, all-new Supra, it does offer a row-your-own gearbox as standard in the Yaris. 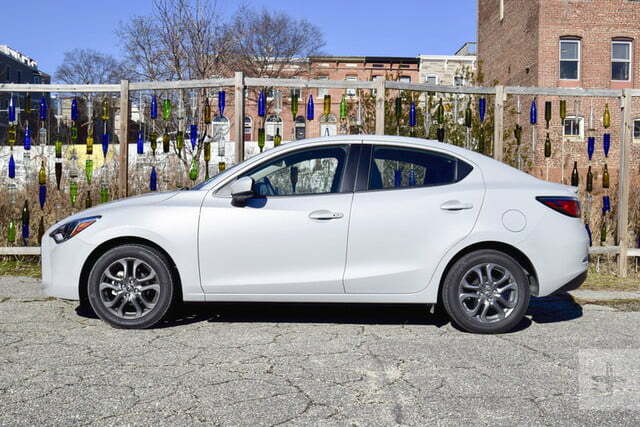 Tick the box for it, and you’re in for a better time when driving spiritedly and will be able to get the most out of the subcompact’s lackluster engine. Adding another sporty dimension into the mix, the XLE trim gains a Sport mode, but the difference between flicking the switch and leaving it off are nearly impossible to detect, with the exception of the transmission holding gears until the engine reaches its redline. 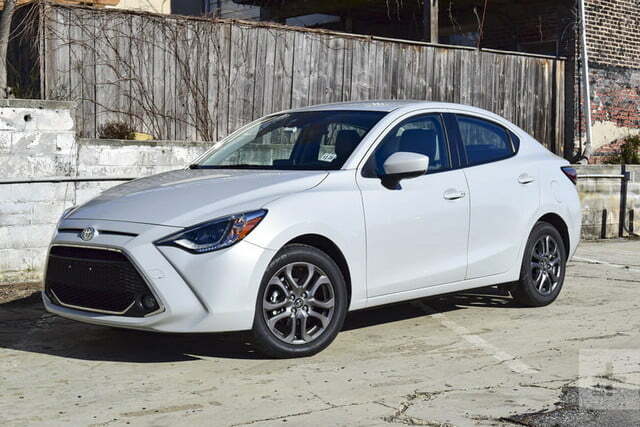 Toyota consistently ranks at the top of the charts for reliable vehicles, but the Yaris still comes with a competitive warranty. 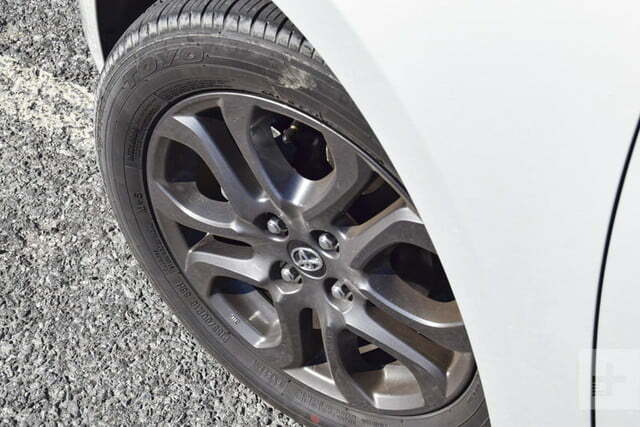 The Japanese automaker backs the Yaris with a three-year or 36,000-mile basic warranty, a five-year or 60,000-mile powertrain warranty, and a corrosion perforation warranty for five years and unlimited miles. With only three trims to choose from, Toyota has simplified the decision process. 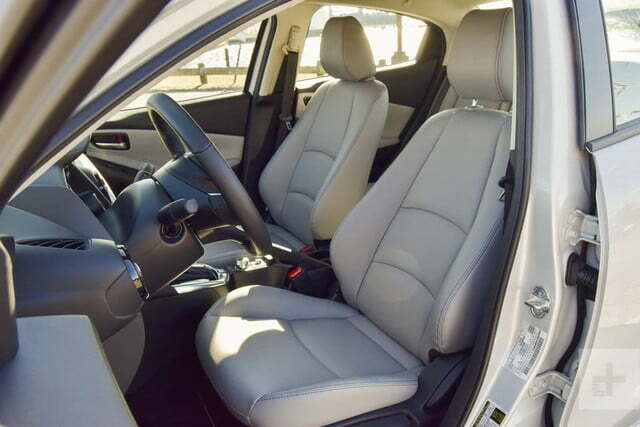 Unless you really hate fabric upholstery, the mid-level Yaris LE is the best value, plus it’s the highest trim that you can get with a manual transmission. The Icicle paint is an interesting choice, but none of the colors are more expensive than others, so that’s purely subjective. With no available packages, pricing for our Yaris, including destination, is $18,480. Tiny subcompacts like the Yaris aren’t exactly popular at the moment, which is a shame, because they offer some of the best value. 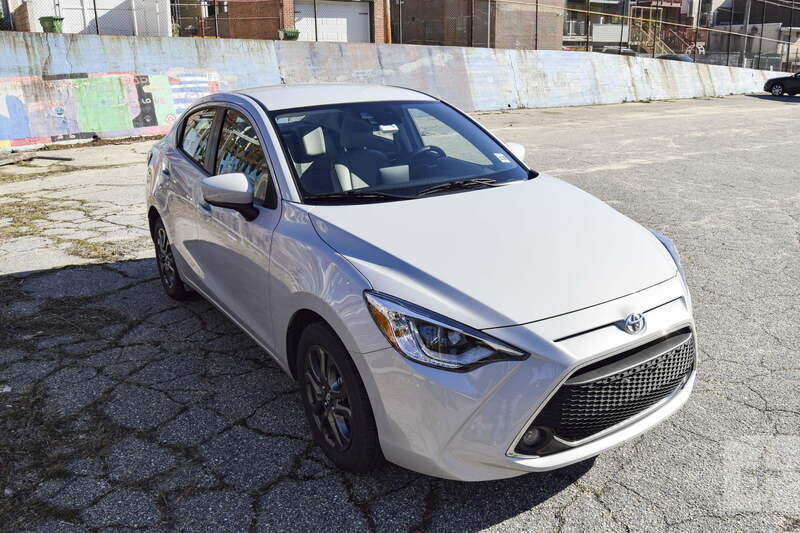 With its nimble handling, good ride quality, handsome cabin, and favorable fuel economy, the Yaris sedan is a well-rounded option. 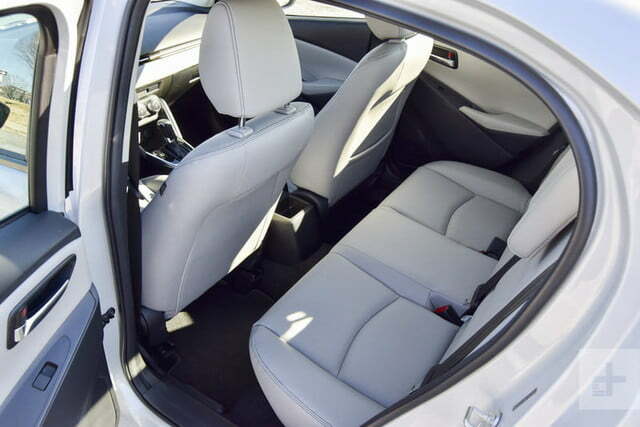 In a segment that isn’t known for having airy cabins, the Yaris’ cramped rear seat and tight trunk may have you looking elsewhere. As far as competitors go, the Honda Fit has a nicer interior, a more spacious cargo area, and more advanced safety features courtesy of Honda Sensing. Going with the Hyundai Accent brings a nicer cabin and one of the best warranties on the market. With a lower price tag than the Yaris’, the Kia Rio brings even more value to the table, and more aggressive styling as well. 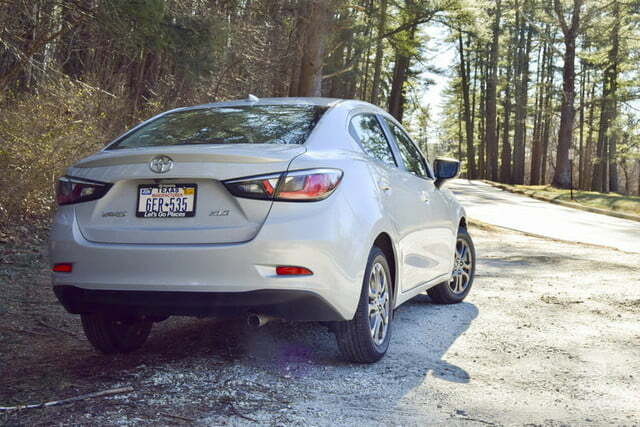 Even with this in mind, the Yaris is a sedan that manages to be a strong option.